Bees and other pollinators are in decline. This is not just bad news for beekeepers and bears, but for global food security – we will all feel the impact if the bee decline continues. EJF is campaigning for greater protection for bee populations. Whether that means restricting the use of pesticides which interfere with their ability to navigate, encouraging people and governments to preserve and cultivate bee-friendly habitats, or simply showing people how they can help save the bees with amazing ideas like bee hotels, we’re doing all we can to try and arrest the trend of bee decline before it’s too late. Urban beekeeping is becoming increasingly popular, with businesses and individuals doing their bit for the bees and enjoying the added benefit of an annual honey harvest. So as the Video Producer at EJF, I have been tasked with gathering footage of bees from some of London’s parks, private apiaries and public buildings. 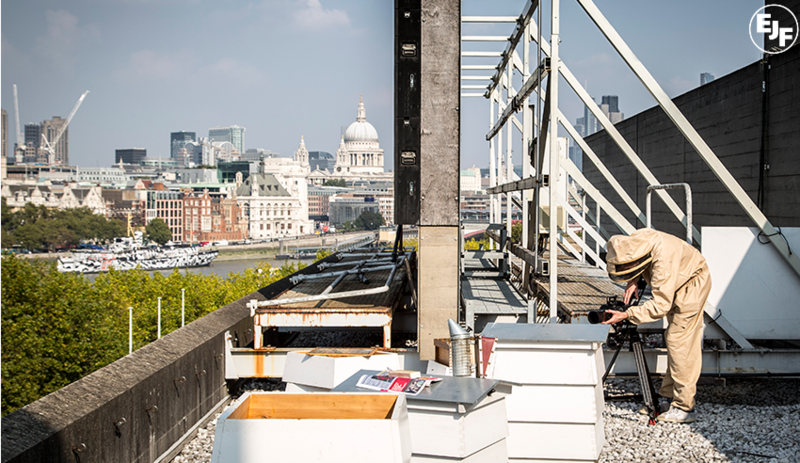 One of the city’s best-kept beekeeping secrets can be found on the roof of the National Theatre in the heart of London’s busy Southbank. The hives up there are home to around 60,000 bees, and produced over 200kg of honey this year alone, all of which will be sold with the money going towards the brilliant work programmed by the National Theatre. I was lucky enough to be invited to film the National Theatre’s beehives this September, just after the honey harvest. After navigating the labyrinthine production offices and backstage areas of the theatre, I emerged onto the roof to see three white wooden beehives, the city and river laid out in miniature below. I was introduced to Barnaby Shaw, the keeper employed by the National Theatre to manage the hives. Today the bees were being treated against Varroa mite, an increasingly common parasite which attaches itself to the honey bee and weakens it. A significant mite infestation will lead to the death of the entire colony, so it’s important to treat against this. During treatment, the hive was to be opened up, allowing me to film the workers inside. We suited up in protective clothing and Barnaby began opening the hives, using smoke to calm the bees before adding the mite treatment. The air was thick with bees, though luckily they didn’t seem too phased by the intrusion of my camera into their home. Shooting with a 100mm macro lens at a very high frame rate allows us to play the footage back in super slow-motion. At this speed and focal length, bees are fascinating to watch. They expertly hover with incredible precision, navigating around one another in the smallest of spaces. Though I could have carried on watching the bees all afternoon, we closed up the hives after the treatment in order to disturb them as little as possible; overstaying our welcome could end painfully. I felt privileged to have been permitted this insight into their world, and I have a new found appreciation for the complexity of their behaviours and, sadly, the fragility of their existence. By making the films we do, EJF hopes to give people a similar appreciation. It’s one thing to understand and accept the economic realities of a future without bees (in pollinating our crops, they provide a service worth $180 billion annually), but to actually see these creatures diligently working on such an intimate scale has given me an understanding of their importance beyond their monetary value.